An entertaining crowd pleaser worth championing. Sing Street made my heart soar and broke it all at once. I can’t tell you why it broke my heart without revealing the ending of the movie, so I’ll just say that I didn’t like the finale (though it makes thematic sense) and leave it at that. 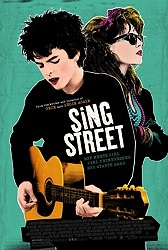 But there are so many strong elements to Sing Street that my reservations about its finale are muted. This is an often quite wonderful movie and proves once again (no pun intended) that the filmmaker, John Carney, who was also behind Once and Begin Again (which I adore) is supremely talented with a great ear for music. First and foremost, the music in Sing Street is incredible. I’ve been listening to its soundtrack repeatedly this past week. Your mileage may vary. It’s very new wave heavy. I’d be lying if I didn’t say that part of my appreciation for Sing Street wasn’t informed by the great Erik Childress’ podcast titled Movie Madness. In it, he and a fellow critic astutely point out that the movie is told from the point of view of its lead character that has an elevated perception of the music he’s creating with his peers and classmates. As a result, all of the music they put together is good…really good…and really good quickly. I’m so happy to have looked at this element through their (meaning, the critics) point of view because what could have been a bothersome detail (the band wouldn’t be that good that fast) is instead reframed into something else entirely. It’s really neat to see a movie about a musician and see his music the way he sees it and not objectively. He thinks his music is amazing and as a result, the music sounds polished and pretty remarkable. The filmmakers here do a phenomenal job creating new music that sounds like it could have been pop hits of 1985, which is when the movie is set. The costuming and art direction is also without peer. This is 1985. It’s not commenting on 1985. Before we go any further, here’s the plot in brief: A teenage boy in Dublin escapes his strained family life by starting a band in order to impress a mysterious girl he fancies. That’s about all you need to know. The movie’s about that, but what’s more important about it are the universal themes in the margins, like how a good support system is crucial to a young person, how important it is to not let your family’s failures dictate your own future, the tonic that is falling in love for the first time and the joys of expressing yourself through art. While most movies have no ambition, this one has all the ambition. It has so many rich themes including fear, love, dreams, failure and an individual’s potential to alter their own destiny while saving others in turn. Carney swings for a home run and hits a solid triple with Sing Street. And that’s ok! Who knows? Maybe my reservations about finale will dissolve on a second viewing. I certainly admire its boldness. Like great music, I suspect this one will improve with familiarity. My quibbles are out of love and genuine concern for the lead characters. The main thing I take away from Sing Street is a great buzz. A movie buzz, that is. A few times every year, you get a feeling watching a movie where you just feel elated by the experience. It could be a specific scene, a line of dialogue, or the whole movie’s energy, it just has to be something that stirs your soul. It’s hard to describe but I liken it to the enlightenment of realizing “yes, this is special to me and I’ll take this with me for the rest of my life.” I’ll take that anytime even if it’s not from a perfect movie. The fact that Sing Street isn’t perfect for me might actually make me love it more to be honest. I love seeing the world through the eyes of this lead character and that’s what the promise of going to the movies is all about. P.S. 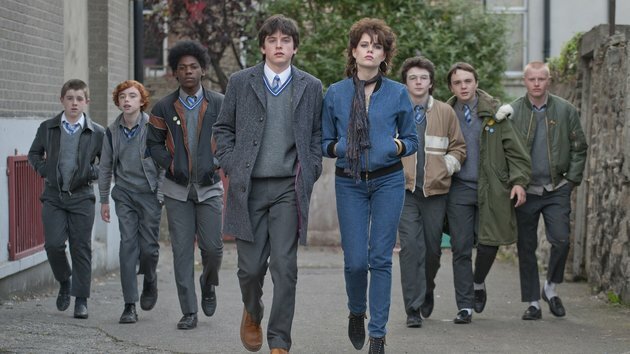 It also makes me want to watch The Commitments, which I’m reading is very similar to Sing Street. "I’d be lying if I didn’t say that part of my appreciation for Sing Street wasn’t informed by the great Erik Childress’ podcast titled Movie Madness. In it, he and a fellow critic astutely point out that the movie is told from the point of view of its lead character that has an elevated perception of the music he’s creating with his peers and classmates. As a result, all of the music they put together is good…really good…and really good quickly." This is something I had picked up on a bit the first time I watched it (I watched it a second time recently because I wanted to bring my mother to see it). It also helps that none of their songs are especially complicated to play and that it's mostly in the vocals and production where the band immediately improves. There's a guitar solo in Drive it Like You Stole It that would maybe be a little tricky, but that scene is overtly fantasy (also Eamon is established as the band member who has the most actual musical talent). Raphina looks way out of Connor's league. Yes, the ending taken as it is presented has some problems and would in real life be insane to attempt. And sure, a scene towards the end where they get a roadie for their band may seem a bit too simplistic, but that's just the movie this is. I love the original songs in this movie. Riddle of the Model is obviously heavily influenced by Duran Duran which makes sense in the movie, but even with some of the songs they do after that you can hear a bit of the influence of the other music they're listening to at the time. Aside from that I just want to mention that Jack Reynor is great as Connor's older brother, and that Ferdia Walsh-Peelo (Connor), and Mark McKenna (Eamon) both do great jobs especially considering that neither of them have any prior acting credits. The kid who plays the bass makes the most of a small part also. In regards to The Commitments, it's worth watching but they don't do any original songs.